We proudly introduce the Vaporesso Luxe TC MOD to you. 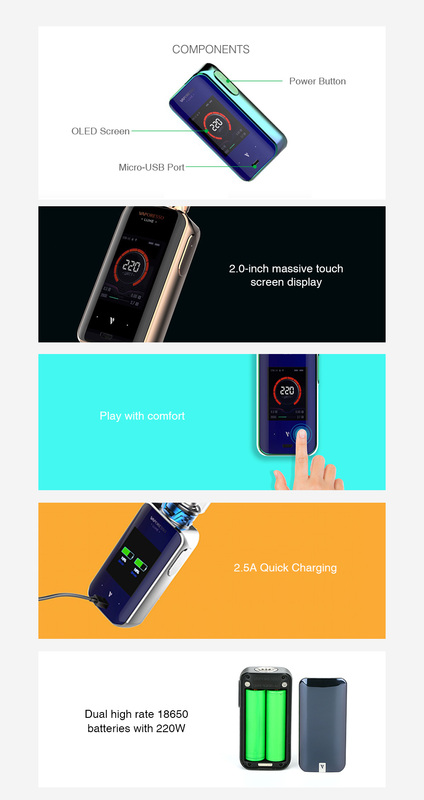 The Vaporesso Luxe is an exquisite MOD, which has the unique 2.0-inch TFT color touch screen, providing a spacious and wide panel for operation. It works with dual 18650 batteries with 220W max output. The Vaporesso Luxe also features the OMINI board 4.0 chipset with 0.001s instant firing speed for stable and powerful vaping. The maximum 2.5A quick charge also makes the charging time shorter than ever. If you are looking for a high end touchscreen mod look no further than the Vaporesso luxe mod. Please note the Vaporesso Luxe Mod requires 2 x high amp 18650 battery to operate which can be purchased here.